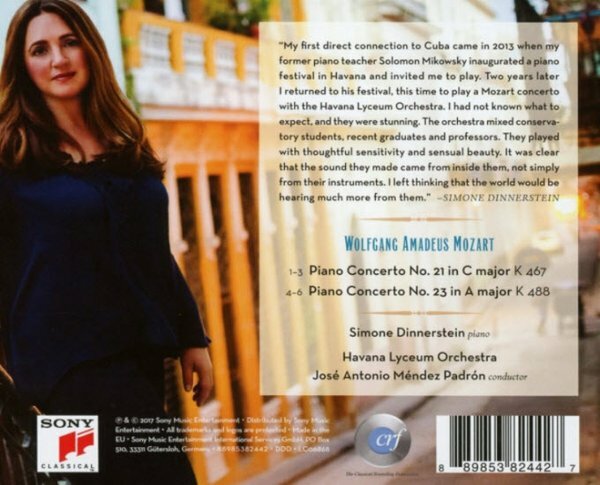 Recorded in Cuba, acclaimed pianist Simone Dinnerstein s new album, Mozart in Havana, may be her most ambitious to date and is a testament to the ability of music to cross all cultural and language barriers. 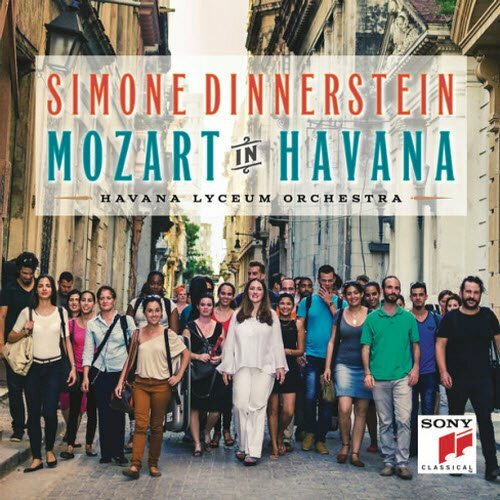 Dinnerstein collaborated with the virtuosic Havana Lyceum Orchestra to perform . Mozart in Havana is a return to Dinnerstein s origins as a musician. Her connection with Cuba started early with Solomon Mikowsky, a Cuban émigré who became her piano teacher when she was all of nine years old. Mikowsky would tell stories of his childhood in Cuba and the country s many musical influences. When he inaugurated the Encuentro de Jóvenes Pianistas (Meeting of Young Pianists) festival in Havana in 2013, he invited Dinnerstein to play, which she accepted without hesitation. Returning to the festival in 2015, she played for the first time with the Havana Lyceum Orchestra and was deeply impressed. Within a year she had returned to Havana to record Mozart s Piano Concerto Nos. 21 and 23, or what would become Mozart in Havana. The recording was done over three long, sleepless nights using donated strings and recording equipment brought in by Grammy® winning producer Adam Abeshouse. What if Mozart went to Havana? Simone Dinnerstein decided to find out. "I think that Mozart seemed like a person who liked to have fun and liked musical puns and camaraderie," Dinnerstein says. "His music is so full of joy and life force, and that is something that is really true of Cuban musicians." 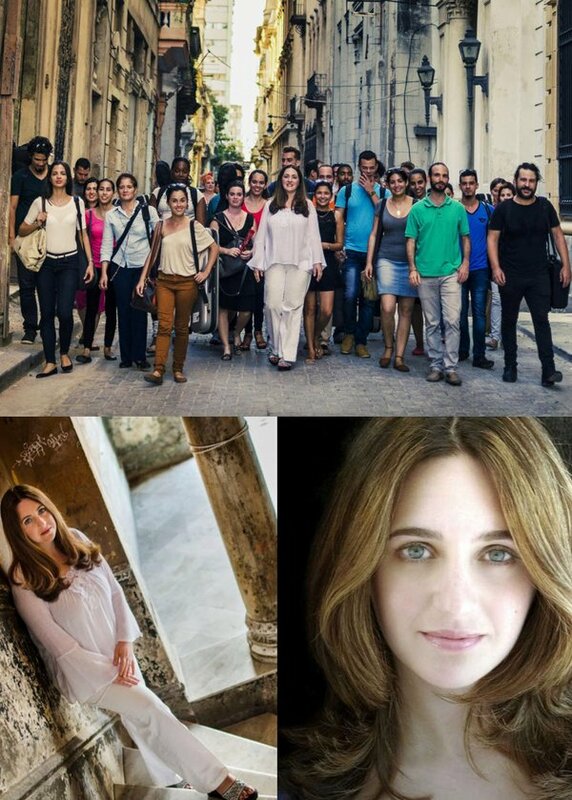 Simone Dinnerstein made her first trip to Cuba at the invitation of Solomon Mikowsky. "He is a Cuban pianist, a piano teacher who I studied with from when I was nine until I graduated high school," Dinnerstein says. "And in 2013, he created this piano festival and invited me down. And that's how I first met the Havana Lyceum Orchestra." You returned in 2015 to perform with the orchestra. What made you want to return to also make this recording, Mozart in Havana? "After that first experience I definitely wanted to go back. And Solomon invited me to go play the Mozart concerto with the orchestra. And I thought, you know, that sounded great. I didn't know … I didn't know what their orchestra was going to be like. And I got there and I heard them rehearsing a Mozart overture, and they were just amazing. I mean, the sound was just fantastic and so beautiful. They have a collective sound. So, it was really inspiring, and very exciting to play with them." I was curious why Mozart was the chosen repertoire. As you mentioned, Solomon invited you to come to Havana to play a Mozart concerto. Why was Mozart the composer that brought you together? "This Havana Lyceum Orchestra is affiliated with the Salzburg Mozarteum. And so they have a tradition of studying Mozart and playing Mozart, and they've gone to Salzburg and worked with the musicians there. And those musicians have also come to Havana. So that was one reason, of course, and the other reason was that … I mean, that concerto just happened to be the one that Solomon asked me to play, the A major, 488, when I went over there. But they played it so incredibly well that that's what I wanted to record. I wanted to record Mozart with them, and I've wanted to record these two concertos for quite some time, and they just were a perfect collaborator on it." Is there a moment in these concertos that was especially meaningful for you that I could highlight for listeners, a little story behind one of the movements? "We were talking about the woodwinds earlier, and there are some really beautiful exchanges with them. Like the end of the slow movement of the C major. There's a beautiful duet with the oboe and the piano. I would say like in the last minute of the of the movement. And I've always felt … whenever I've performed this piece, you know, I always try to connect visually with the with the oboist and in general with the wind players … Sometimes it can be hard to see them because they're sitting far back. But we were set up so that I could see everyone very well … the wind players really wanted to connect with me, and in fact, sometimes they'd ask me to play for them so they could hear how I was playing it so that they would make sure to be playing it in the same way. And I just felt that that came together so beautifully at the end. I felt like we were really talking to each other, first the oboe and myself and then the flute joins in as well. And it just it was true chamber music." "That's a good question. I think that for me it was extremely inspiring to work with the players there and the conductor. And I had had a very strong vision of how I wanted these pieces to sound. And I guess I learned that with enough practicing and enough rehearsing, that can actually happen. Like it's possible for an orchestra and a pianist and a conductor to all work together to create a sort of unified depiction of a piece of music. I think that that's something that I always hoped to do and I felt like that really happened with this recording." To hear my full conversation with Simone Dinnerstein, and more about Mozart in Havana, look for New Classical Tracks on iTunes or wherever you get your podcasts.